The peer-reviewed study is published online, and will be featured as an "Editor's Choice" in the February issue of Brain: A Journal of Neurology, published by the Oxford University Press. The study showed that "brain vital signs—a breakthrough for analyzing complex brainwave data to provide a simple, practical and objective physiological evaluation of brain function—is more sensitive in detecting brain function changes related to concussion than existing clinical tests for concussion. 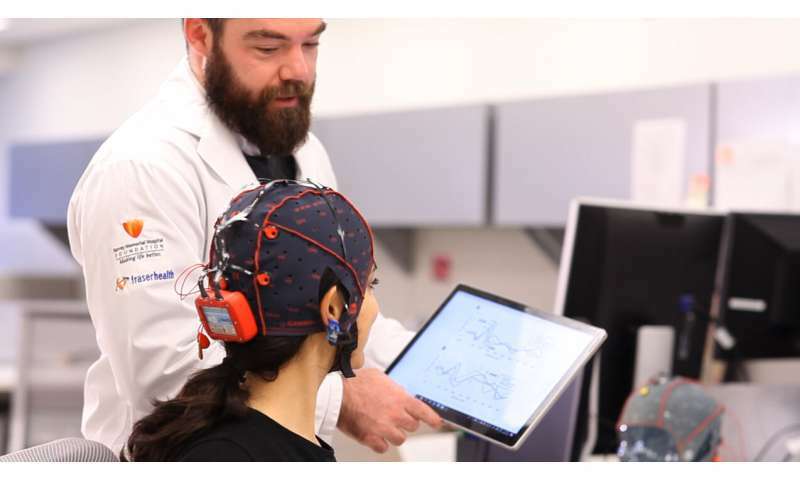 Brain vital signs translates complex brain waves from portable electroencephalography (EEG) - measurable at the rink-side—into fast, user-friendly and intuitive results. "Sports-related concussion is a major topic of discussion amongst scientists, clinicians, the medical community, the sports industry and various governmental agencies. There is growing concern that concussions may be associated with an increased risk of persistent cognitive and mental health impairments later in life," says Dr. D'Arcy. D'Arcy points out that despite dozens of clinical studies examining sports-related concussions, there remains a major gap in terms of objective, physiological measures of brain function that can be easily deployed and readily used at point-of-care. According to Shaun Fickling, the study's lead author and a Ph.D. student at SFU, "What's even more surprising is that not only did we find undetected physiological impairments in players diagnosed with concussions who were cleared to play, we also found that players who were not diagnosed with concussions showed decreased cognitive processing speed post season—thought to be the result of repetitive 'sub-concussive impacts.'" Dr. Aynsley Smith, Ph.D., sport and exercise psychologist and concussion investigator at Mayo Clinic Sports Medicine, adds: "Mayo Clinic has been on the forefront of research into the prevention, diagnosis and management of concussion in ice hockey. We recognized the need to move beyond subjective concussion diagnoses that relied on questions—that players could deny or exaggerate—to more objective measurements. This is why we were pleased to collaborate in this study." Dr. Michael Stuart, M.D., professor of orthopedic surgery and the co-director of Mayo Clinic Sports Medicine, further explains, "Concussion in sports, especially in ice hockey, is a global public health issue with an estimated 1.6 million to 3.8 million sport-related concussions occurring per year in the United States alone. There is a growing urgency to develop practical approaches that use objective, physiological measures, which are also rapidly and easily deployable in sport and clinical settings so medical staff can better diagnose and treat concussions."